A lot of New Yorkers, myself included, are getting a little extra kick out of the vibe of Grand Theft Auto IV's Liberty City, which recalls our home boroughs with just enough accuracy to be disorienting. The farmacias and bodegas in East Holland, the Starbucks-esque cup in every hand, the prevalence of "Craplist" social interaction, even the thriving Russian community beside the boardwalk in Hove Beach where the story begins all capture that tickly feeling of home. But MTV Multiplayer's Stephen Totilo notes that from Bohan to Schottler, there are a few things about New York that GTA IV gets wrong, and he's compiled a tongue-in-cheek list of eight key items that are, as he says, "grossly misrepresented." 1. We are not a car town: No sensible New Yorker uses a car as their primary means of transportation in the city, unless — maybe — they commute from the suburbs. Car ownership doesn't make much sense. There are never any parking spots. Parking garages are prohibitively expensive. And, most importantly, the subway is a faster, cheaper and more efficient means of transportation. We don't drive here. Niko, to be a real New Yorker, should rely on the subway. But what would he be left to grandly thieve? True enough. Certainly, in New York, only rich commuters who live in swanky penthouses or in the outlying boroughs have cars. Rent here for the average denizen is pricey enough without the cost of gas and parking — and, that aside, I'd never even think of owning a car here just due to the crushing traffic and inconvenience. But there are a lot of cars here nonetheless, and having been many times a pedestrian nearly clipped by some crazy speeder cornering badly, it's a fun turnabout to be behind the wheel this time. If you do happen to be in a car, people always seem to be wandering into the crosswalk at the worst of times — that, at least, is accurate. Totilo picks more hangups: There are no dinosaurs at the Met! Times Square — er, Star Junction — should be much more congested with pedestrians, it's true. And bagels are a quintessential part of our diet, unobtainable in Liberty City. 8. We eat bagels: Have I missed something or is it not possible to eat a bagel in "Grand Theft Auto IV"'s Liberty City? Niko can eat burgers, hot dogs and go to diners. But bagels? The most famous New York City food? Never fear, visitors to our town, we have bagels that can be eaten and enjoyed, whether Liberty City acknowledges it or not. Burgers? Waste of time. You can eat them in any town. 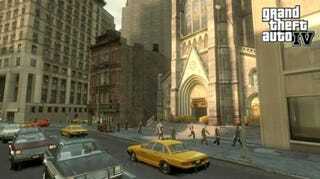 Two more that he missed: First, why do Liberty City's pedestrians walk so slowly? You can always spot a tourist as the one who's ambling casually down the sidewalk, neck craned upward to eyeball the skyscrapers. But real New Yorkers, everyone knows, walk at a breakneck pace, head down, heedless of who they shoulder aside, as we are all on the way to someplace very important and you'd better get out of the way. And finally, where are Manhat— um, Algonquin's legions of tiny, tiny little doggies? It's the must-have accessory for Upper East Siders. We don't mean to quibble with such a fantastic game world, but, you know.